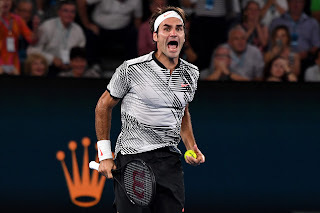 He’s been a man on a mission in Melbourne the past two weeks and the dream came true for Roger Federer on Sunday evening as he toppled his great rival, Rafael Nadal, 6-4, 3-6, 6-1, 3-6, 6-3 in the Australian Open final to win his 18th Grand Slam championship. “I’m out of words,” said Federer, after receiving the trophy from Rod Laver. “I'd like to congratulate Rafa on an amazing comeback. There are no draws in tennis, but I would have been very happy to accept one and share it with Rafa tonight. The comeback had been perfect as it was,” said the Swiss, who was playing his first tour-level event after a six-month injury lay-off. 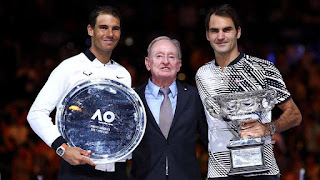 All out aggression from Federer proved decisive as he defeated Nadal in a Grand Slam final for just the third time in nine contests. He had lost all three previous battles with the Spaniard at Melbourne Park - including a heartbreaker in the 2009 final - and had not beaten Nadal in a major since 2007. But Federer righted those wrongs with a sublime display, marking his 100th match at the Australian Open in style. It is Federer’s first major title in almost five years, since defeating Andy Murray in the 2012 Wimbledon final. Since then, the Swiss has been forced to watch Novak Djokovic largely dominate the Grand Slams, losing to the Serbian in the 2014 Wimbledon title match and in 2015 in the Wimbledon and US Open finals. It was remarkable feat for Federer and Nadal to meet across the net in another Grand Slam final and their 35th battle overall. After their semi-final wins - five-setters against Stan Wawrinka and Grigor Dimitrov respectively - they both told the story of being too hobbled to play an exhibition match at the opening of Nadal’s academy in Manacor in October, making do instead with sponge balls against junior players. But sheer will and hard work saw them both find their best level and rise to the occasion in Melbourne, taking advantage of shock week one defeats for Novak Djokovic and Andy Murray - to Denis Istomin and Mischa Zverev - to bring about a nostalgic final for tennis enthusiasts. Indeed, it was only the fifth occasion in the Open Era that a Grand Slam final has been contested by a pair of 30-somethings. The last time it happened was at the 2002 US Open, when 31-year-old Pete Sampras defeated 32-year-old Andre Agassi to win the title in what would be his final ever match. 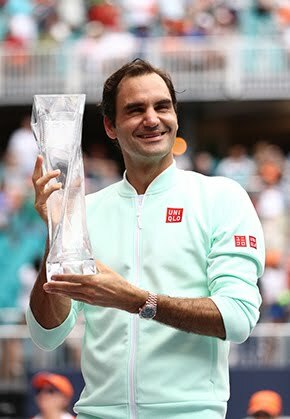 With wins over Tomas Berdych, Kei Nishikori and Wawrinka to reach the final, Federer is the second player - after Mats Wilander at 1982 Roland Garros - to win four Top 10 matches en route to a Grand Slam title in the ATP Rankings Era (since 1973). He is also the first player to win three five-setters en route to a Grand Slam title since Gaston Gaudio at Roland Garros 2004. 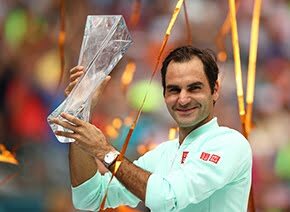 He is the third man in history to win five Australian Open titles, adding to his victories in 2004 (d. Safin), 2006 (d. Baghdatis), 2007 (d. Gonzalez) and 2010 (d. Murray). At No. 17 in the ATP Rankings, he is the lowest ranked Australian Open champion since No. 18 Thomas Johansson won the title in 2002. But the Swiss right-hander, who spent 302 weeks atop the rankings, is now set to return to the Top 10 at No. 10 on Monday. The Swiss superstar now 18-10 in major finals. For Nadal, he has come a long way from crying in the car on the way back to the hotel after injury forced him out of Roland Garros before he could step on court for his third-round match. He would later call on his 2016 campaign after a second-round defeat in Shanghai in October, not able to continue any more with his wrist the way it was. The Spanish left-hander is now set to rise to No. 6 in the ATP Rankings after returning to his best to reach his 21st Grand Slam final (14-7 record). Federer hit 73 winners, including 20 aces, and won 76 per cent of his first service points. Nadal, who went 4/17 in break points won, committed 28 unforced errors - 29 fewer than Federer. The Swiss is now 12-23 in their ATP Head to Head series. First Set: The hyperbole surrounding a final between these two all-time greats did not appear to affect Nadal or Federer in the opening exchanges of their 35th meeting - and fourth on Melbourne soil. Predictably, each player centred their tactics on targeting backhand wings and opening up the court - yet through the first six games there were two love holds. The battle for baseline dominance reached fever pitch at 3-3, when Nadal failed to consistently hit his first serves into court and Federer seized the initiative courtesy of a forehand drive volley for two break points. The pressure mounted on Nadal, the longer the rally went on at 15/40. Ultimately, he struck a crosscourt backhand wide. The Rod Laver Arena, largely pro-Federer, erupted at the first service break of a high-quality opening. Federer consolidated the break with a love hold for a 5-3 advantage and later hit two aces to secure the 34-minute set. Second Set: The level of play ratcheted up with Nadal winning six of the first seven points. Federer was drawn to the net by Nadal, whose groundstroke depth rushed the Swiss into error. Nadal earned his first service break when Federer mis-hit a forehand for a 2-0 lead, prior to a testing third game. Nadal led 30/0, but lost the next three points and was forced to save two break points as terrific athleticism and elasticity by 35-year-old Federer belied his age. Trailing 0-4, Federer loosened up and Nadal’s relentless groundstroke length faltered, momentarily. At 30/40, Nadal went all-out on a forehand down the line, but Federer was able to flick a forehand back and into an open court to break. Nadal held his nerve and with two straight love holds, he clinched the set when when Federer struck a forehand long. Third Set: Federer got out of jail in the first game. Having led 40/0, Nadal won five straight points but was ultimately unable to convert three break point opportunities - as Federer struck an ace each time. Having edged through, Federer seized the momentum by breaking Nadal for a 2-0 lead. A sublime backhand half volley down the line at 30/30 did the damage, followed by a deep backhand return that Nadal attempted to run around to hit a forehand into an open court. The Spaniard ran out of time and the pressure further mounted when Federer went on to hold to love for 3-0. At this stage, Federer was zoning on his backhand, quick in his movement to his forehand, and was not allowing Nadal time to recover with a number of drive volley winners. Nadal continued to battle and came through a nine-minute game for 1-3, saving three break points, but emotion, frustration got the better of him and two games later he was broken to 30. Federer then saved two break points to complete a remarkable turnaround, after overcoming the pressure of the opening game, with a backhand drop volley winner. For the first time in his ninth Grand Slam final against Nadal, he led two sets to one. Fourth Set: One mental lapse on an easy forehand at the start of the fourth game cost Federer dear, as Nadal soon wrestled away the momentum. At 15/40, Federer was drawn to the net to retrieve a low backhand but stretched and volleyed into the net. Nadal’s mental strength was undimmed a game later, when he produced a tremendous flicked crosscourt forehand winner - at full stretch - off a fine Federer backhand crosscourt angle for a 4-1 advantage. At the change of ends, Federer applauded after watching the big screen replay. Federer held for 3-5, forcing Nadal to close out the 40-minute set - which he did courtesy of a Federer backhand into the net. Nadal went into the decider knowing he’d won three of their previous five five-setters. Fifth Set: Federer returned after an off-court medical time out to serve first in the decider. The time lapse provided respite, but not for the Swiss who lost the first two points. Under pressure, Federer went after Nadal’s backhand and saved one break point, but a forehand error at 30/40 gifted Nadal the break. Nadal then saved three break points for a big hold that got his coach, Uncle Toni, out of his seat. But Federer, who received on-court treatment on his right thigh at the 1-2 change of ends, wasn’t finished. Federer kept applying the pressure, playing as close to the baseline as he could, and in the next game forced Nadal to rip a backhand crosscourt winner at break point. Although Nadal maintained his break advantage for a 3-1 lead, the match could turn on its head with a moment of brilliance. It did in the sixth game, with Federer levelling the score at 3-3 on his second break point chance when Nadal struck an in-out forehand wide. Nadal showcased terrific mental fortitude at 3-4 when he recovered from 0/40 and saved four break points, but Federer was relentlessly aggressive and controlled the baseline. At the fifth time of asking, the Swiss broke when Nadal was drawn out wide to hit a forehand into the net. With new balls, and some nerves, Federer went on to save two break points and close out his 100th match at Melbourne Park for an emotional - and memorable - 18th Grand Slam championship crown.